Premium features without breaking the bank. Apple surprised the tech world on Monday with the online announcement of two new iPad models, including the revival of the “iPad Air” brand that has been defunct for three years. The monicker will now see a new life in the form of the 10.5-tablet, which adds some more features for creatives while folding in some specs from the iPhone XS. In reality, the new iPad Air might be dubbed the “iPad Air 3.” Apple launched the original iPad Air in 2013, which was marketed as offering a slimmer design than its predecessors. But it was discontinued after the release of the 9.7-inch iPad Pro on March 2016. Apple has apparently decided to reboot the the name in the midst of a major re-shuffling of its tablet offerings. Apple now offers a total of five total models, with the new iPad Air serving as a middle ground between the two premium 2018 iPad Pros and the smaller, more affordable 9.7-inch iPad and iPad mini. This allows users to choose from a diverse roster of screen-sizes. Apple's new iPad line up with the Air right in the middle. Apple is the clear leader in tablets, and accounted for more than a quarter of global total tablet shipments during the third quarter of 2018, according to November report from the International Data Corporation. That’s more than double the shipments of Samsung, its nearest competitor. A steady stream of yearly iPad releases ensures customers can get their hands on the most up-to-date specs. But after so many launches the iPad line is now a little confusing, especially when some models only differ by a few inches in size. Here’s where the new 10.5-inch iPad Air is bringing to the table. The iPad Air is Apple’s mid-tier price choice for tablets. It starts at $499 for wifi connectivity and 64GB of storage capacity and it can get as expensive as $799 to add cellular and 256GB of memory. Apple is posing the iPad Air as a way to access some of its premium table features at a lower price. Apple’s latest iPad is currently available for pre-order in a select group of countries and the company said they’ll begin shipping the week of March 25. The press release for the product launch did not include a specific date of when they’d arrive. Customers living in: Australia, Austria, Belgium, Canada, Czech Republic, Denmark, Finland, France, Germany, Hong Kong, Hungary, Ireland, Italy, Japan, Luxembourg, Netherlands, New Zealand, Norway, Poland, Portugal, Singapore, Spain, Sweden, Switzerland, the UAE, UK and U.S. will able be able to order the tablet on the Apple Store. Just like the iPhone XS and XS Max the iPad Air is available in three signature colors: silver, space gray, and gold. It comes in the same color variants as the iPhones XS and XS Max. The iPad Air has three standout features that define it: Apple Pencil support, Smart Keyboard compatibility, and the same processor as the iPhone XS and XS Max. Users will be able to sync the first-generation Apple Pencil to the iPad Air to doodle, take notes, or make precise edits on 3D models. The tablet will not support the second-gen Apple Pencil, which attaches magnetically to the iPad Pros and can accept a charge when attached. 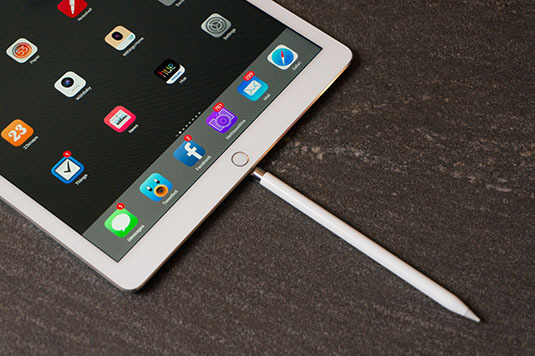 That means iPad Air users will still need to awkwardly plug the stylus into the tablet’s Lightning Port to charge. It supports both the first-generation Apple Pencil and Smart Keyboard. If the stylus isn’t enough functionality, users can also purchase an Apple Smart Keyboard for $159 extra. The attachment is ideal for anyone who uses their iPad to answer emails or write essays for school. Finally, the iPad Air received the A12 Bionic chipset, the same processor found inside Apple’s latest iPhones. Apple promises the tablet will deliver, “70 percent boost in performance and twice the graphical capability” when compared to the 9.7-inch iPad that comes with an A10 Fusion chip. Apple notably chose not to feature the A12X Bionic chip in the two iPad Pro models introduced last October. The company is marketing the Air as offering “high-end features and performance at a breakthrough price.” Choosing to skip on the A12X was most likely a way to keep price down while still making it capable of running more than “5 trillion operations per second” like 2018’s iPhones. With its price and premium features, it could be a smart purchase for students who are looking to use it like a more portable laptop. 2,224-by-1,668 resolution with 264 pixels per inch. Fully laminated display for extra protection with an antireflective coating. A single 8-megapixel rear camera with a ƒ/2.4 aperture. A single 7MP selfie camera with a ƒ/2.2 aperture. Built-in stereos speakers at the bottom. And dual micrphones for calls, video recording, and audio recording. Charges using a Lightning connector. Has a 3.5mm headphone jack (it’s not dead yet!). Uses a Touch-ID finger print sensor instead of Face ID. The lack of a USB-C port might be a dealbreaker for users thinking about replacing their laptops with an Apple tablet. But the iPad Air is the device to pick up if you’re looking for a taste of a premium tablet without having to drop $800 on a basic model.